The freezing of winter converts the inulin to fructose, which makes spring roots more palatable for eating. Spring roots are less bitter and chewy – just make sure you dig them before the plants start to blossom. Spring roots are also higher in taraxacin, which stimulates bile production. What's the Best Way to Harvest Dandelion Roots? To dig roots, use a dandelion digger or a sturdy fork. You want to break/damage the root as little as possible so you don't lose much sap, which is where the medicinal properties lie. Deep, rich soil will produce the thickest, easiest to harvest roots. I always let a few dandelions go in the garden, as they are great for reaching deep into the soil to bring up nutrients. Make sure to harvest from areas that have not been sprayed/treated with anything noxious. Select large, vigorous plants – small, spindly plants will have small roots that are not really worth harvesting. One session of garden digging produced the root in the photo at the bottom of the post. How should I Preserve Dandelion Roots? 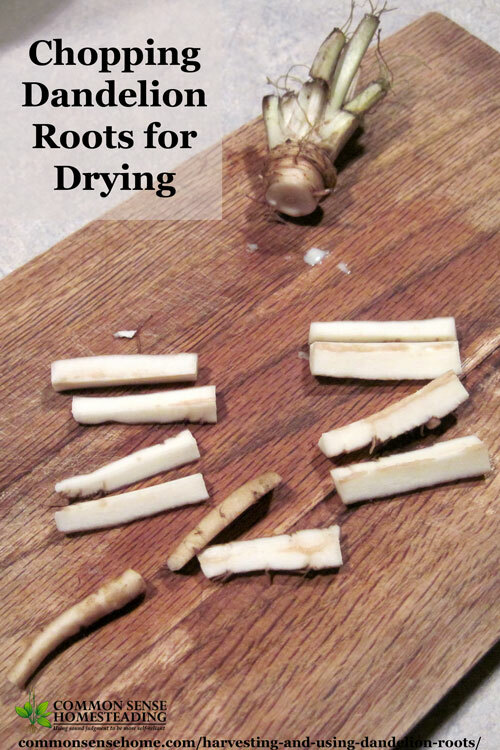 You can use dandelion roots fresh for cooking and medicine, or preserve them for later use. For long term storage, drying works best. Scrub roots well before cutting. Slice thick roots lengthwise into strips of uniform thickness to decrease drying time and encourage uniform drying. 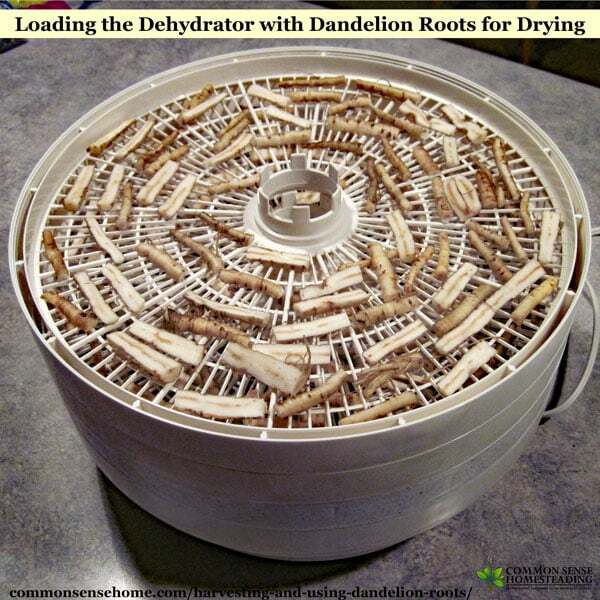 Use a dehydrator to dry the roots at 95°F (35°C) until brittle. Alternatively, spread on a screen and place in a cool, dry location with good air flow, and dry for 3 to 14 days (until brittle). Dried roots will keep for about a year. To make dandelion coffee, start with dried roots. Chop or break into small, even pieces, roughly 1/4″ across. Spread on a roasting pan and bake in a warm oven (200°F, 93°C) for around 4 hours. Stir occasionally. The dandelion roots should be browned and dried completely through. Cool completely. Grind and use as you would regular coffee, or place 1 heaping teaspoon of ground root in a cup of water, steep for 10 minutes and strain. Store in an airtight glass jar and grind just before use for best flavor. Don't have time to dig or a clean spot to harvest from? How do I Use Dandelion Root? Dandelion root is well known as a detoxifying agent, but has also been used to treat everything from arthritis to hangovers. Traditionally, dandelion has been used a diuretic, to increase the amount of urine the body produces in order to get rid of excess fluid. It has been used for many conditions where a diuretic might help, such as liver problems and high blood pressure. However, there is no good research on using dandelion as a diuretic in people. Fresh or dried dandelion herb is also used as a mild appetite stimulant and to improve upset stomach. The root of the dandelion plant may act as a mild laxative and has been used to improve digestion. There is some very preliminary research that suggests dandelion may help improve liver and gallbladder function, but the study was not well designed. Some preliminary animal studies also suggest that dandelion may help normalize blood sugar levels and lower total cholesterol and triglycerides while raising HDL, “good,” cholesterol in diabetic mice. But not all the animal studies have found a positive effect on blood sugar. Human studies are needed to see if dandelion would work in people. A few animal studies also suggest that dandelion might help fight inflammation. To extract the medicinal compounds from the roots, use a decoction or tincture. Decoctions are water based, while tinctures are generally alcohol based. A decoction uses water and extra heat, and is generally used for tough materials like roots and bark. To make a decoction, place one ounce of dried roots or two ounces fresh roots (by weight) in a pan with one pint of water. Bring to a boil, cover, and simmer for 20 minutes. Strain and compost the spent roots. (From Dandelion Medicine.) Root decoctions can be used to make simple healing teas. Herbal infusions are steeped for a longer time at lower temperatures, and are typically used for leaves and flowers. To make a strong herbal infusion tea, use 1/2 ounce by weight of dried leaves or one ounce by weight of fresh leaves per cup of water. Place the ingredients in a glass canning jar. Cover with freshly boiled water. Put the lid on and steep overnight. Strain and compost solids. For medicinal purposes, drink 3-4 cups per day. Alternatively, use a French press, or steep (covered) for at least 20 minutes before straining. Help your body metabolize fats and improve elimination of wastes with these cleansing herbs. This tea helps the body to clear phlegm and open the lungs and sinuses. I hope you'll give this humble weed a second look. Weekly Weeder #17 – Common Dandelion – range and identification, wildlife uses, uses for food and medicine. Don't forget to check out the other Herbs and Wildcrafting posts, too. I love the post on dandelions. This spring, once the young leaves and first flowers were picked, I just let the plants get mowed with the rest of the lawn. We don’t have a specific spot for them, per se. Keeping the uses in mind, I am going to leave a patch for fall harvest, too. Thank you for sharing these tips and for hosting this link-up! I love the dandelion blossoms in spring time. They bring such a blast of color, and are always covered with bumblebees. As a huge Dandelion fan my whole life, I have hunted down the sweet weeds that tend to grow in remote place and off the beat places. I have noticed that the inner city dandelions have been wiped out! They are still growing here and there, smaller and weaker from the assault on them by big phama and weed killer for too long now. Finding and bring home the large rooted and very mature plants to my home garden has been a wonderful experience for us here in Oregon. Remember the ” Rolling Stones ” song ” Dandelions will make you wise, tell no lies. The world around us wants them dead. Shows the real power that this weed has. Uses are many and benefits are profound and long lasting. I have more respect for the Dandelion. then the Rose! I wasn’t aware of those song lyrics. Thanks for sharing your experiences dandelion hunting. Jari, thanks for insights into dandelion harvesting and use. Yes, Pharma does not have my best interests in mind, root herbals seem to be the safest and sacred of all medicines. big pharma wants to get rid of anything that they can’t make money off of. dandelions are a super plant.. that is why it’s so hard to get rid of them. they are wonderful for soooo many things and they are mother natures creation. big pharma only cares about you being sick so they can make you buy pills. if we all used what the planet has provided for us from the beginning of time, big pharma would be no more. THEY are the ones that pay scientists to post studies that dismiss or even demonize mother nature. they are evil. mother nature gives us all that we need to be healthy and thrive. I have actually found the “government research papers” contain supporting evidence that the Industry who upon receiving this research, tailor it to Fit Their Means, to pick and choose what to share with us and proceed to add on words of anthropomorphism, thus manipulating our subconscious Emotionally, and thus proceeding to create an Environment of FEAR/False Evidence Appearing Real. resulting in getting us to set our sights on seeing only half the picture of what Actually is occurring, and calling the other half of creation a Disease. Upon reading and comparing research papers of the Gov, to those formulated by the Industry will show you exactly what I am referring to. Anthropomorphism has no place when describing actions/ reactions occurring within the body. Microbes ADAPT to their Environment, They do not Invade, Attack or Steal, and Hijack their Host. Since they live within us, that makes us their environment and therefore they are Adapting to each Individual’s frequency matrix. [i.e. Energy field/Aura]. Can I post and link to your articles/blog? You may share content from my blog as long as full credit is given and content is linked back to the site. I love reading everything on your site! Could you please tell me the difference in infuse and decoct? 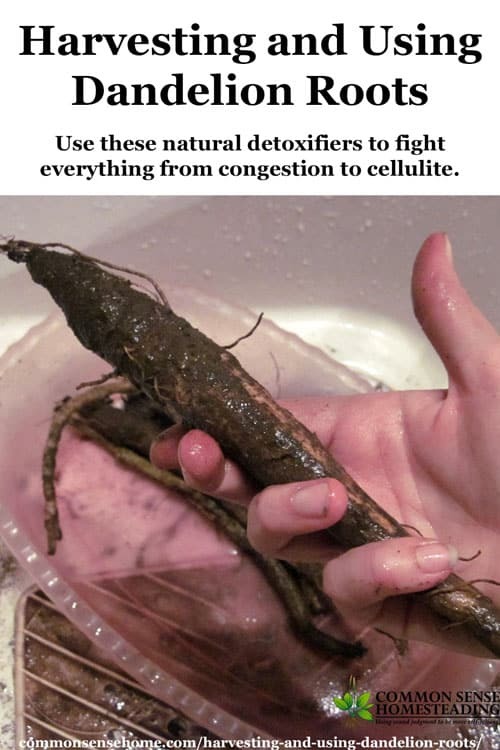 I’m interested in trying those for decongestion and cellulite tea…. but am not familiar with the terminology, so I’m not sure how to go about it. Beth, I’ve highlighted the start of the decoction and infusion instructions in the post. A decoction requires boiling, and is used for tougher materials such as roots, whereas an infusion uses boiling water poured over the material (basically tea). I love reading about ways to supplement food with wild plants….. I am encouraging my scouting friends to try wild plants as a survival plan… I enjoyed your review and will keep looking into bettering my knowledge on the subject… I already eat dandalion leafs in salads….they are very tasty …. Keep up the great reviews…..
I’m hoping to dig a few fresh roots here as soon as the first hard frost comes through. 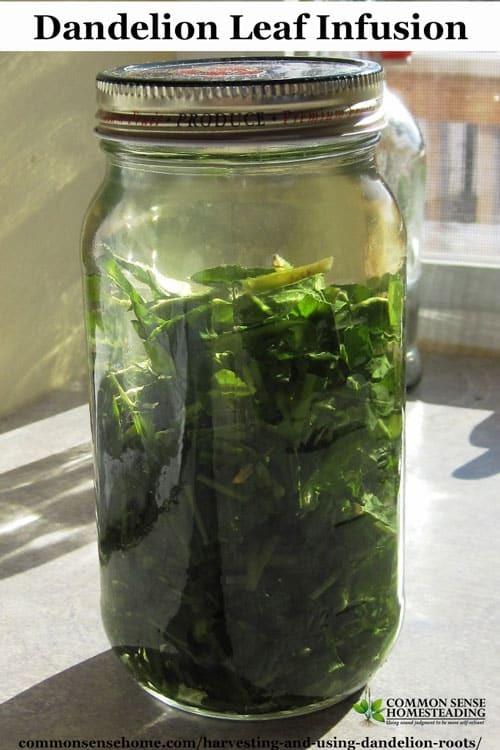 Fresh works best for tinctures, according to Susun Weed. She (and most other herbalists I’ve read info from) suggest 80-100 proof vodka or alcohol. 40 proof is only 20% alcohol, not enough to draw out the medicinal properties. Yes, that should have read 80 proof. Thanks for the correction. After it sits in the vodka, then how do you use it? And can dandelion be used to loose weight? And how? As mentioned in the description for the “I’m sick of cellulite tea”, dandelion and other herbs may help your body metabolize fats and improve elimination of wastes, which can lead to weight loss. Typically medicinal doses for teas are 3-5 cups per day. Tinctures (steeping the herbs in alcohol) may be used in small amounts as a daily tonic. Some herbalists strain after 4-6 weeks, some let the herbs remain in the alcohol and draw off what is needed. There are many schools of thought on how to use herbs, and each person responds differently. She did say 80 proof and 40% in brackets. I am thinking of investing in another dehydrator and am wondering what brand is yours, where you got it and what ‘extra’ pieces did you purchase with it, and most importantly given the chance what one would you purchase? Same one or a different one? (Right now we are doing apples with cinnamon and the whole house smells like apple pie!) Thanks for your time in doing all you do. Love the web site and ‘like’ you on FB! The one in the photos is an American Harvest Snackmaster, and it has been a good workhorse for many years. I bought extra trays, and mesh inserts, and extra fruit leather trays. I bought it at the local hardware store (FleetFarm). Recently, I bought a nine tray Excalibur, along with fruit leather sheets, from Amazon.com (free shipping). It dries foods faster and holds more, and you can culture yogurt in it in mason jars. If I had to only choose one and had the budget for it, it would be the Excalibur. Love my Excalibur… I have 2 of them. Don’t know what I would do without them. Then I have a couple of smaller round one. Sometimes I have all 4 going at one time….. Thanks for this. I also have a homesteading type blog where I present our adventures as outlier suburban farmers here in North Texas, growing seasonal veggies and a wide selection of medicinal herbs. I have a bed dedicated to dandelions, and I’ve been tincturing leaves and roots all season. But now that we’ve had a couple of deep freezes, I was wondering whether to continue to harvest my 2+ year old roots, or wait til Spring. I get the sense that I’m best waiting til early Spring to maximize medicinal content. Thanks again and I’ll be a frequent visitor to your wonderful blog. I’m not sure how much of a difference it would make, though. I’m sure all are good when grown in reasonably healthy soil. Somehow I trust the wisdom of nature. True the root changes with the seasons, however people’s needs do too. Perhaps we need spring roots in the spring and fall roots in the fall. It could be. All things are connected. During ww2 my uncle roasted the roots to make a coffee substitute. As I was a child I have no idea how it tasted. Dandeliion wine is on my list to make this spring. As always, an excellent resource here, Laurie! Sharing!! Todd – I need more wine racks! Thanks for your kind words. My Mother used to dig up dandelion plants every year to make for us to eat. she would cook the leaf’s and drain them then she would take fried bacon and cut up hard boiled egg’s she would put them in a pot together. Then she would mix sugar and vinegar together and pour it over the dandelion it was very good. She also took the dandelion flower and she would wash them and then take and dip in egg’s and flour and fry them they are so good. My Mother was a good cook. That’s wonderful that you learned to enjoy them at a young age. That’s how my grandma would cook them in the spring too. She said that you had to eat five messes of dandelion leaves before it flowered. It was wonderful. Never heard of flowers being breaded and fried. I can’t wait to try it. Ann, have you ever seen the movie “Like Water for Chocolate”? It revolves around the idea of infusing emotions into food while cooking – and a very strange romance. You mention that they shouldn’t be harvested after they bloom. Is this just for flavour or are the medicinal properties reduced? Would like to harvest but mine are almost all in flower. Also we rarely get a freeze, never had one this year, would this mean that they would be the same or more similar to autumn roots. Thank you for a great article! I’m interested in harvesting dandelions from our lawn. We used a lawn service a few years ago. How many seasons would you say a lawn needs to be “chemical free” before it is clear for harvest, or is it ever? 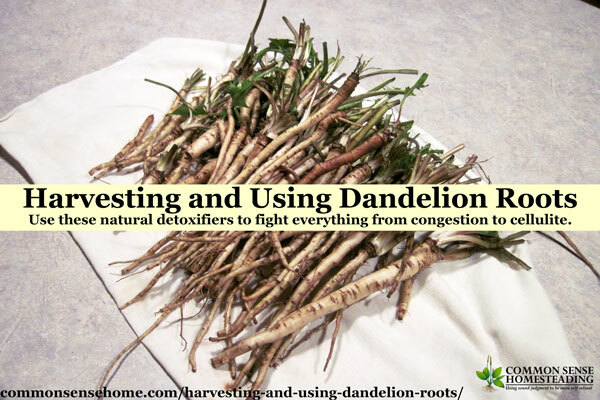 Lovely article on harvesting and using dandelion roots! I received a lovely gift bag with chocolate in various forms, plus a recipe (& ingredients!) for dandelion cocoa! I planning on making some dandelion tea/coffee. Last year I spot sprayed dandelions in this area of my yard. Would this years dandelions be ok to use for making a drink? I know that around here they have to wait three years after spraying for organic certification. I’d highly recommend harvesting from a no spray area if possible. Hi! I have been wanting to purchase a dehydrator for some time now, to dry medicinal herbs and make homemade dried fruit. I’m on a very tight budget, due to major health problems and several surgeries. Could you please suggest a model that’s not too expensive, but will work well for my needs? I’ve read that it’s possible to dry herbs and fruit in the oven at a low temp, but I’m concerned about needing to have the oven on for an extended period of time (with little ones running about) in order to dry everything correctly. Thank you ahead of time for your help! Have a lovely weekend! I bought my no frills 4 tray Nesco Snackmaster Dehydrator (pictured in the post) over 15 years ago, and it’s still going strong. Over the years I added two trays , mesh inserts and additional fruit leather inserts. A couple of years ago I bought an Excalibur 9 tray because the Nesco was making weird noises, but whatever was causing the noise must have come unstuck, because now it’s running fine again. Now I use the Excalibur for big jobs and the Nesco for smaller jobs. The current Nesco FD-60 Snackmaster Express 4-Tray Food Dehydrator is only $58.42 and qualifies for Prime shipping. A local restaurant, Kismet (Montpelier, VT) makes a delicious dandelion latte with milk (cow’s or soy, your choice) and maple syrup. It’s wonderful. I’ve made my own by digging roots, scrubbing them, roasting them whole until dark brown, and then grinding in a coffee grinder. I use the ground roots just like ground coffee. You can also do this with chicory roots. Thanks for the great information– we have a huge field of dandelions near our house and I’m looking forward to making your dandelion wine! And for those who don’t have their own stock of dandelions or chicory, Frontier sells bulk bags of both, ground and roasted. I think I’m going to miss dandelion wine season again, as we’re rather behind in the garden due to all the permaculture plantings this year. Thanks for sharing such great information! What are your thoughts on using dandelion infused oils using the flowers? Would using the roots be more effective? What applications would you suggest? Please reply and Thank you so much! Different parts of the plant store up more of certain compounds, but the entire plant is useful and edible (maybe not so tasty at times, but edible). I know the flower infused oil/salve has been used to treat sore muscles, dry skin, arthritis and joint pain relief and more. Please advise me with my questions below. Thank you. May i know, what is the average numbers of flower in a single dandelion ? What can we do with he flowers ? Are there any ways to preserve them ? You can dry the flower petals and leaves for later use. Flowers can also be infused in oil to make a dandelion salve base, or used to make dandelion wine. Oh – and the number of flowers varies by the size of the plant and growing conditions. There is no “average” that I am aware of. Can you eat Dandelion roots raw? I’m not much of a cook…. You can, but they don’t taste very good. They are quite bitter. Some people shred them and ferment them with cabbage in sauerkraut, too. Of course, if you really like bitter food, you could try and grate some and sprinkle them on a salad. We usually put dandelion roots in our morning smoothie. Tastes fine to us. I’ve been trying to make sure it’s OK to eat the roots raw, but until now have never been able to find the answer. I assume if there were any problem (other than some people not liking taste of raw dandelion root), u would mention it? I’ve never seen anything saying you shouldn’t eat them raw, other than for flavor. I’ve tried them raw with no ill effects. I tried Dandelion tea for the first time this morning and my blood pressure dropped from 153/89 to 136/69 in about an hour. Instead of composting the leaves and roots I ate them with my Ramen noodles and egg. I’m hooked; no more aspirin for me. Will dry plenty for winter months. Wow – that’s a pretty amazing result. That’s what I wanted to know! I did a search for “can you eat rehydrated dandelion leaves” since I bought a huge bag of dried leaves from Frontier. I have eaten fresh leaves that were steamed or sautéed. I just didn’t know whether you could eat the reconstituted version. Other places say make tea and compost the used leaves. My search landed me on this webpage which obviously didn’t address the query, but it looks like this comment answers it. Thank you. This post was focused on the roots, but it’s absolutely safe for you to eat rehydrated dandelion leaves, just like any other edible green. The texture isn’t like fresh greens, but if you use them like Roy as a “mix in” to other dishes, they work just fine. Pick the tiny dandelion buds while still firmly closed and toss them into your soups. They are quite tasty. When dandelion leaves get too large and start to turn bitter, simply cover the plant with a piece of cardboard or something to keep the sun off for around 4 days. When the leaves turn a pale greenish-yellow, you will find them quite tender and sweeter again without the bitterness. You can pick newer leaves all season for salads without doing the blanching with a cover trick…. Simply by picking out the newer leaves while leaving the whole plant, it will encourage the plant to keep putting up new leaves. What is the difference between dandelions who’s leaves are smooth and dandelions that appear to have really thorny leaves and less flowers? Hi, I’m interested in using dandelion root to help treat my daughters leukemia. It sounds like many people make teas and I’m wondering if cooking the root destroys any of the medicinal properties? Also I read somewhere that the dried root can be pulverized and put into water to drink. Any thought? Roots tend to have constituents that can only be extracted using heat. It would be safest if you worked directly with a local herbalist so they could help you develop a full treatment protocol. Thank you for the great information. In our area of California, there is a ton of what we call dandelions, their leaves are fuzzy, not thorny, just a bit more leathery than the classic dandelion described in many herb books, is it still ok to harvest for flowers and roots? It would be best to get a confirmed identification before using the plant. You should be able to take a sample into your local cooperative extension office for an ID. If you have a specific health condition that you are trying to address with dandelion, you should work directly with a trained herbalist to determine the proper dosage, or try adjusting your dosage incrementally and see how you feel. I dig dandelions in the late autumn and fall to make dandelion coffee. I put the roots on a wire mesh and wash them clean with a domestic power washer. It will remove all the soil and debris from the roots, but use the fan instead of the jet as the jet may peel the skin off the roots. Slice them in a food processor. spread the slices on aluminium foil and put in the oven at about 100 deg. C until crisp. Remove half and continue to roast the other half at a higher temperature until chocolate brown colour. Mix this half with the other, light coloured half which will contain more medical qualities and grind the lot in a coffee grinder and store in a glass jar. To make a cup of coffee boil a cupful of water in a small pot and add about one teaspoonful of the coffee and continue to boil for about half a minute or so. Strain into a cup, and add milk and sugar if you like. Have as many cups of this coffee-like drink as you like as it is very good for liver, kidneys stomach, and much more. Unless you have another blog, you copied this article Word for Word from another person who published the same article in 2014. Is that you or is this just copied? I’d like to know who I supposedly copied it from, given that I originally wrote the post back in 2012, and updated it again in 2014 and 2017. That’s my counter top, my window, my cutting board (if you look really closely, you’ll see that it’s unusually narrow because one of the sections of wood broke off), my pink plastic bowl in the top photo that was given to me as a Christmas fruit basket from my sister, and most of all, my dandelion roots. Maybe you read a copied post previously? I’m talking content not photos. I was searhing a key term yesterday and happened upon your blog as it was first in Google results. I then went back to look at some of the other articles and noticed there was another post from 2014 from another blog that had the exact same wording. After reading your reply I highlighted one paragraph of your post and pressed “look up” on my phone. There are currently three other blogs that use this exact same wording. So somebody copied somebody. Perhaps they all copied your article from 2012? If so it’s good to know that you are still first in Google results….and this article is great btw! Apparently enough to be reprinted by others. Can you let me know what search terms you used or where you found the content? I don’t allow reprints, so someone is illegally stealing my content. Hi, Great reading. I’ve just made my first litre of tincture (Dandelion virgin) I will leave it for 100days and then strain out. I was wondering if it would be useful to also use dried root ground to a powder in a coffee grinder to fill capsules with or would it be a waste of time because no heat will have been applied? Does it have to be heated to be effective? As I understand it, heat or alcohol do help to make the nutrients and compounds more available, but given the large number of dandelion root capsules available for purchase, odds are you’re still getting something out of the powdered root. I love the little sun ball flowers of the spring. I eat the flowers raw in salad make fritters and infuse into olive oil for breast massage oil. The greens I add to salads or even grab and mouth full straight off the plant and chew while working in the yard. The roots are dried and made into a nice brew. But into a coffee? Or tea? Not so. Coffee is an actual plant not just a drink and tea is an actual plant just as dandelion is an actual plant. Really wish bloggers would get this right. So I have a nice cup of hot dandelion while hubby has a nice cup of hot coffee. Never have eaten the root tho. Think in will try this out. We don’t get to many bumblebees bees but plenty of little bees and this year we got amazing amounts of hummingbird moths all over our dandys and it was an amazing sight! Nice article. While coffee and tea are indeed specific plant species, the terms “coffee” and “tea” are now regularly used to describe beverages with similar flavor profiles, whether or not the original plants are involved. It’s not a mistake, it’s a common usage of the terms. Hi, i’ve just gathered a load of dandelion roots to make powder. The flowers are in full bloom (may 4th) will these be ok to ingest? It won’t hurt you to eat them, i.e., they don’t suddenly become toxic. When the plant flowers, it pulls energy and nutrients out of the root. This may the root tough, with less nutrients and lower medicinal quality. I make a powder all the time. Keep it in the fridge. Use it to clean out my liver and kidneys, I dehydrate, put in blender and make a powder. can use it for tea. Or just take a little on a teaspoon with water. Great stufff!!!! Great article! For those of us in the north with snow in the winter, should we harvest roots in the fall as well? Right now we have lots of dandelions blooming. I’d like to pick the heads to infuse. Is this a good time to do that? Should I be leaving the roots alone? I’d like to try making the ‘coffee’. I often dig dandelion roots in fall when I’m harvesting other root vegetables. Roots are best harvested in fall or early spring before blossom time for maximum nutritional/medicinal value, but if you want to experiment with dandelion coffee now for the heck of it, we both know there will be more later to harvest at the “right” times. Pick the blossoms when they show up and use promptly, as blossom season is come and gone in a flash. Great article, Laurie. Thank you for writing such an informative piece and updating through the years. While harvesting potatoes at our CSA, my son brought me a huge root and asked what it was. Realizing it was dandelion I decided to start collecting the roots to bring home. They have now sat for two weeks uncleaned. Would anything have been lost during this time or can they still be processed as if fresh? To date I have only consumed the leaves and flowers or purchased dandelion “tea”. Ideally it’s best to process them as soon as possible after digging. If the green are still attached, the roots will do their best to keep the greens alive, sending up nutrients out of the root. If the greens have been clipped, the roots are likely in better shape, but they will be wilted and much more difficult to clean. Might as well try working with them if you have time. Nothing to lose. Want a wonderful, natural, free side dish or appetizer? Since I was a young girl my dad would pay us .25 cents a bowl for dandelion heads. Mom would batter them like chicken and deep fat fry them. I have done this since I was old enough to cook I’m 50 now. My neighbors always know if I am out picking flowers in m pajamas I’m fixen to fry dandelions lol. My sons on a Saturday morning would hear, smell or have radar not sure would come busting out of their rooms and get excited for dandelions!! One sure way to get them up early!!! Its as natural for them as having French fries. They remind me of mushrooms and my sons love them with ranch dressing! Is that first picture really a dandelion root? Where on earth did you find one that big? That’s amazing :O I’d love to have seen the plant it was attached to. I leave a few plants in my garden to mature and dig them up in the fall when I’ve harvesting other root vegetables. What’s the difference medicinally between a dandelion root decoration and the dandelion root coffee? The decoction normally uses raw or dehydrated roots, slow simmered, which allows more of the compounds from the root to infuse in the water. The roasting process for coffee may cook off some of the volatile compounds, and coffee is not typically slow simmered, so there’s less time to transfer compounds into the water.